CLEARANCE - Up to 50% off Hundreds of products, includes Baby, Kids, Furniture, Lighting and more! Looking to spruce up your house? Changing the curtains? Looking to give your kitchen that added bling? Or just fancy an upgrade? Dunelm is one of those UK brands where you can literally do all your home shopping in store or online. Their company is built around the strong relationships they have with people, not just their customers, who they value above all, but also their suppliers and 9,000+ staff. As the no1 homewares retailer you can of course expect to find plenty of products that are going to enhance any room in your home. The company focuses on style, quality and value and are always working hard to make their customers’ lives a little easier. With 30,000 products in store and over 300,000 online, you’re guaranteed to never be too short on ideas too! Dunelm has over 3 million customers visiting their stores and website each week, so if you haven’t checked them out then you’re missing out! The Dunelm ranges include everything from furniture for throughout your home, beds and bedding, curtains, blinds, rugs, lighting and much more. All of their categories offer a wide variety of products and all at price ranges to suit your budget and taste. They offer beautiful brands for you to add to your home, from Camille Ivory, Toulouse White and Amelie, to more traditional Sherbourne Oak furniture styles. Every month Dunelm adds 100s of fresh designs, online exclusives, big brands and even bigger ranges to give you the best choice possible. So it’s always worthwhile taking a second look to see if there is the perfect interior product to suit your dream home. The last time we checked over 1500 products had just been added to their online store! Dunelm not only provides its customers with a huge range of products but there are also some pretty notable deals too! Their website’s offers page is home to a wide variety of savings from 30% off bedding, up to 50% off furniture and cooking utensils to much more. So whether you’re looking for new furniture or just some quick style refreshes to add a bit of new life to a room, there’s definitely going to be a great deal waiting for you. Customers can also take advantage of their newsletter sign-up, which not only keeps you in the loop with their latest offers and range additions. But you’ll also be in with a chance of winning a £250 gift card. With Christmas just around the corner you can find everything from decorations to gifts for kids at Dunelm. It’s the ideal location to get all your festive shopping done in one spot and save you a good deal of time and stress whilst doing so! 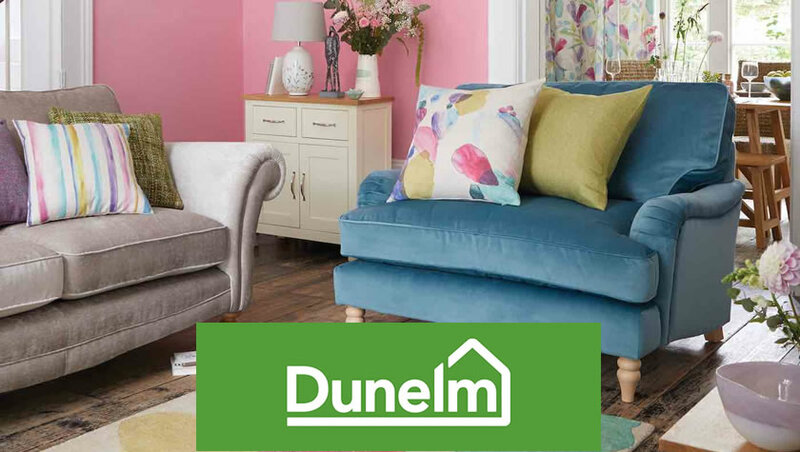 Dunelm provides its customers with plenty of support, from free standard UK delivery on all orders over £49 to a Reserve & Collect feature where you’re able to pick up your order within 3 hours, that means you’ll never have to go to one of their stores in search of a product to find it isn’t in stock. You’ll also find many employees in store who are incredibly friendly and happy to help, whether you’re looking for a specific product or would like some styling advice. Before you do head to one of their stores or website, be sure to check in with us for all the latest Dunelm discounts and offers. Together we can help you get that dream home you want for less! How do you rate Dunelm? THE HUT – Big Savings on Clothes, Bags and more!